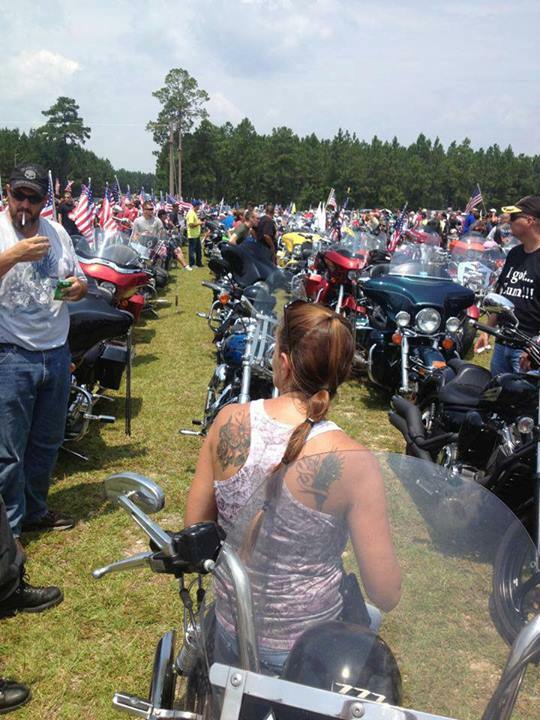 Members of the Patriot Guard Riders and others from the Hinesville, Ga. community honored Sgt. Stefan Smith on Sunday in an effort to derail a planned protest of the fallen soldier's funeral by members of Westboro Baptist Church. Last week, Westboro announced its plans to picket the memorial for Smith, a 3rd Infantry Division soldier killed in Afghanistan last month. As word spread of Westboro's plans, community members launched a Facebook group organizing a counter-protest. The group drew nearly 2,000 supporters who planned "to create a human barrier/shield to protect the family of Sgt. Stefan Smith from seeing the WBC and their stupidity." LaGrange News and WSAV report that counter-protesters lined the road Saturday as Smith's body was transported to a funeral home in Hinesville. And on Sunday, members of the Patriot Guard on motorcycles let the procession to a church in nearby Ludowici. According to WSAV, Westboro protesters were a no-show at the funeral. "Originally it was to protect Sgt. Smith's family from the Westboro Baptist Church and the ignorance of why you are all here," counter-protester Eva Newbold said of the effort. "But it turned into showing our support for the military and our families, so we all just came out here to show our support." Westboro, which the Southern Poverty Law Center has deemed "arguably the most obnoxious and rabid hate group in America," is infamous for its anti-gay protests of military funerals and other events. The group believes deaths in Iraq and Afghanistan are God's punishment for the United States' toleration of homosexuality. In recent years, the group's protests have been met with counter efforts like the one at Smith's funeral. Human walls protecting fallen soldiers' families from seeing the picketers are a popular tactic. In August, President Barack Obama <a href="https://www.huffpost.com/entry/honoring-americas-veterans-act-obama_n_1748454">signed the Honoring America's Veterans Act</a>, dealing an indirect blow to Westboro Baptist Church by declaring that protests at military funerals -- a favorite tool of the congregation -- must be at least 300 feet away. The law also says such demonstrations are prohibited two hours before or after a service.